London has been going through a ramen craze in recent years and it doesn’t seem to be tailing out anytime soon with the additions of Kanada-ya and the Japanese mega-chain Ippudo, bringing part of the East into the thriving scene. Having tried a number of ramen joints in London, Hong Kong and Japan, I have become slightly disillusioned with ramen but I can still appreciate a good bowl when I eat one! Kanada-ya serves hakata tonkotsu ramen, originating from their founding restaurant in Yukuhashi, Fukuoka on the island of Kyushu. 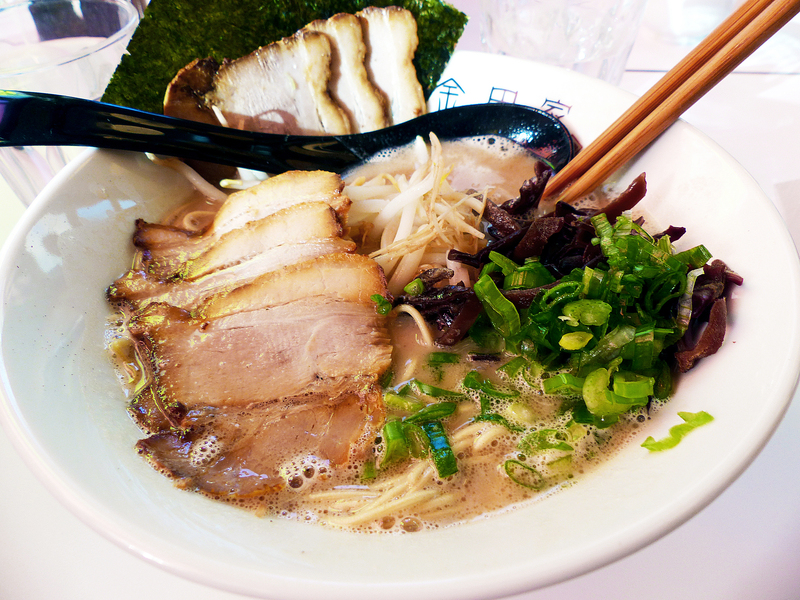 Fukuoka is famed for their hakata tonkotsu. Their London branch is located on a small cornershop, in comparison to its glitzy neighbours opposite the road, Ippudo (review coming later). Due to its size and popularity, queues have been common in recent months. Whilst it is quite cramped inside, it’s almost expected in popular Asian establishments. There aren’t that many choices to choose from but what is available should quench the thirst of ramen addicts for now. Having tasted some of the best ramen on my recent trip to Japan and having read a lot of good reviews for Kanada-ya, I had high expectations for it. What I received, the Original, was a bowl of ramen cooked to the right firmness, as asked, hard (as it should be), with a rich (but rather clear) pork broth and a welcome addition of wood ear fungus bringing in an extra chewy texture to the bowl of ramen. The pork was decent, though I generally don’t have too much of an opinion on the thin sliced char siu the Japanese put on their ramen. What is disappointing is the exclusion of the classic soft-boiled egg! You can add it as an extra coming in at £2 for their Hanjuku egg. I feel this is a little steep for what should really be included in the bowl. At £10-£12.5 for a bowl of ramen Kanada-ya is priced reasonably alongside its competition. Service is brisk but you’re not exactly expecting a long, relaxing sit down meal either by going to a Ramen restaurant. If I go there again I would like to try the Chashu-men as it looked rather eye catching when the pair across our table were eating it! I have never seen so much char siu in one bowl of Ramen! The promise of thicker cuts of char siu is enough to make me order it let alone the quantity. Needless to say, there really isn’t anything on the menu if you are vegetarian. Overall, I would definitely recommend Kanada-ya for ramen in London. Whilst I can’t give a direct comparison of it to some of its competitors, which I’ve been to a while ago, such as Shoryu and Bone Daddies, I will say that it provides a decent bowl of noodles when Japan is feeling just a little too far. This is Kanada-ya’s first venture outside Asia, they have branches in Japan and Hong Kong and a second branch in London coming in September!